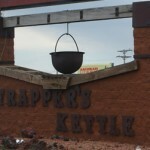 Trapper’s Kettle in Belfield, ND definitely qualifies as a “famous” truck stop, restaurant and motel. 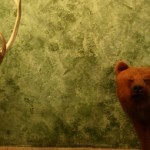 It was even profiled on the Travel Channel as one of the most unique tourist attractions and hotels. Since our trip to Medora took us down Route 94, we discussed staying overnight in the motel. But it appears from online reviews that the owners of the Trapper’s Kettle have not put much money back into the facility and the novelty of the hotel wore off for most of these travelers once they put their key in the door. We agreed that a quick stop to see the place was probably enough. We expected it to be larger than it was, and for us – at this point – gift shop scholars – theirs was woefully inadequate. They could do a better job of stocking less standard items like coffee mugs and candles and feature items either made in North Dakota or that at least celebrate the state’s trapping and hunting heritage. It’s hard to imagine a rugged mountain man trudging through the snow after two days in the wilderness stammering bow-legged to the gift shop for three lavender-scented candles and a coffee mug with a buffalo on it. The restaurant, however, was a different story. It was well-adorned and made me feel as if little had changed little over the last sixty years. Trophy animals line the walls, older men in cowboy hats sip coffee with their meal and even the door handles, made from real leg traps fit the theme. I was impressed, and though we didn’t eat, we imagined the fried chicken with mashed potatoes would be exactly what a hunter needed before bedding down in the hotel. And outside it was clear that this was still a preferred stop for truckers. Our sweet little LaFawnduh was surely intimidated next to these diesel behemoths. One of the most unique features is the hotel’s horse stables. There were four stalls designed for traveling horsemen to lock up their horses in an exercise pen overnight. I think with the mountain men now few and far between, this hotel has become a bit of a novelty, but it seems as long as men ride the roads in their big diesel wagons, this place will have a customer base. One of the best places I have ever stayed. The food is great (Sunday buffet!!!) Ithink is fantastic. Freiedly people clean lodging and if its your thang, a great place to pull a cork!!!!! !